A collection of 4 blackwork animals and birds, all available as instant downloads. Three of these use shading to give a lifelike effect, while the fourth is more stylized. There are various ways of shading a blackwork design. 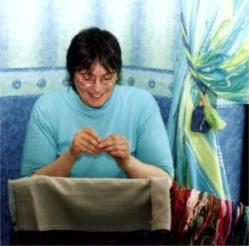 The method used here is to add extra stitches to the pattern in the darker areas. 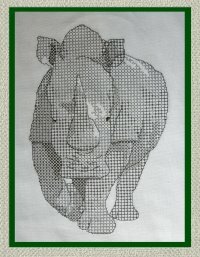 If you haven't tried shading before, you might like to try out my free pattern first or download my Blackwork for Beginners ebook. 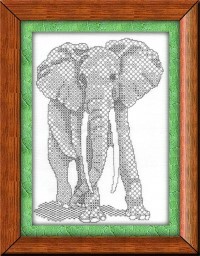 One colour, dark grey, is used throughout this design of an African elephant, the largest living land mammal. Asian elephants have smaller ears. A partner design to the one above, the strength and size of this white rhino are apparent to all who see it. Again the design uses a single blackwork fill pattern with variations to achieve the realistic shading. Minimal outlining is used in this design, making it a little more challenging. 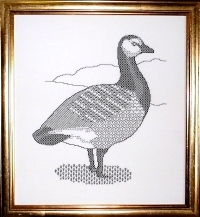 This goose got its name during the Middle Ages when people believed it hatched from barnacle shells! 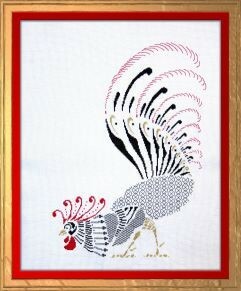 Blackwork and cross stitch are both used in this portrait of a french style cockerel in black, red and gold metallic. The Chinese dedicate a year in their calendar to the rooster. 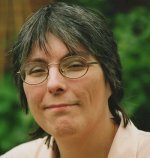 The last year of the Rooster was in 2005.